As a direct importer and distributor of BMC/Polymer manhole covers, sewer and drain covers, trench covers, gully gratings and grids inlets, all our stocks are kept in our warehouse and ready to be delivered. There is NO LEAD TIME as long as the stocks are available and enough for the orders. We may deliver the stocks in Johannesburg and Pretoria at a cost of fuel and e-toll, but only to the secure places. Free Delivery may be offered in East Rand depending upon the quantities of manhole covers, sewer and drain covers or gully gratings ordered and the distance from us. 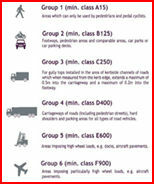 To other districts and cities, logistics or courier services can be organized at low costs. Please read Shipment for details. Although we prefer to call our product as BMC manhole cover, SABS named it Polymer concrete manhole cover. The word of "Concrete" usually misleads most of clients to think of cement. To prove the weight tolerance of our manhole covers, two medium duty 500x500x40s Primus® Bar (Gully Gratings) and Square manhole covers were applied for the tests by simply laying over the curbside and bricks and a one-ton pick-up was used to drive over and park on the covers while the photos were taken. No damage was found after the tests. A Wuzland® medium duty 50KN 600x600x40 square manhole cover was also tested for its weight tolerance by a sedan at the same way, no damage was found. This product is confirmed to be compliance to the South African environmental protection policies and laws. Our products are made of BMC material and metal frameworks inside by high technology and advanced manufacturing process. BMC products are non-recyclable, there is no scrape value and other usage for BMC manhole covers. 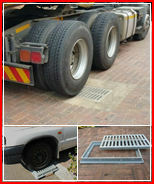 This completely resolves the problems caused by stolen iron cast manhole covers which usually happens in South Africa. Researches and tests have been done to conform that the longevity and load capacity of BMC manhole covers is improved to a revolutionary stage compared with the cement covers, and for this reason BMC manhole covers can be used to replace the iron cast ones. 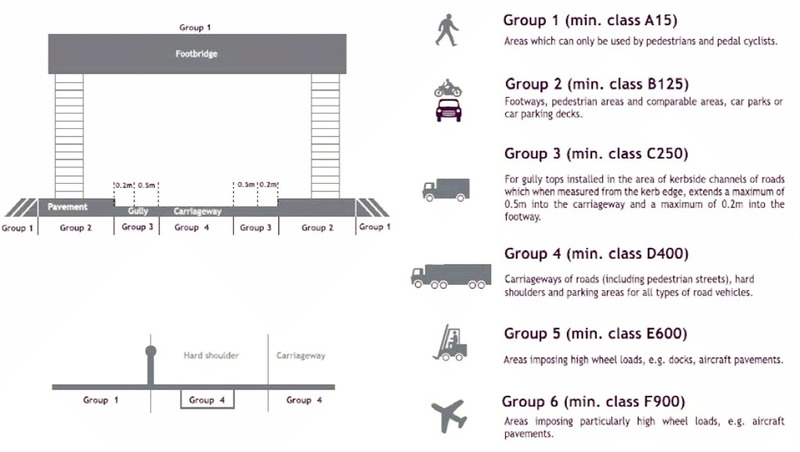 The forces applied in the SABS tests for polymer manhole covers (SANS1882:2003) and iron cast manhole covers (SANS558:2009) to classify the duty classes of light, medium and heavy are the same, this means BMC/Polymer manhole covers can be manufactured as strong as iron cast ones, or even stronger, and are able to replace the iron cast manhole covers. BMC/Polymer manhole covers can be made to different colors as the customers' requirement while the color change of iron cast or cement ones has to rely on painting which doesn't last. BMC manhole covers tolerate the change of temperatures from -50℃ to 200°C. They are corrosion resistant, insulated and never rusty. Compared with steel and concrete manhole covers, BMC/Polymer manhole covers are lighter in weight at the same classes of duty, there is no excessive noise while opening, closing or moving of BMC manhole covers, no need of locks and easy to access, no noise and rebound while driving over. Polymer or BMC manhole covers are composite products, unlike steel or cast iron ones, they are not as flexible as the metal. When the force applied to the steel and cast iron manhole covers is over their force resistance limit or load capacity, they may become bent before being broken, while in the same situation the polymer manhole covers will be broken straight away. Because of this property of less flexibility than the iron, a hammer can be used to knock chippings out of the edges of polymer manhole covers although as a whole they are strong enough to load dozens of tons vehicle. The certain strong "point force" caused by striking and crashing from other hard articles may damge the surface and edge of the polymer concrete manhole covers. Therefore moving, carrying and shipping of the polymer manhole covers has to be done with cautions, as well as lifting and closing of the covers. Installation of polymer manhole covers also needs to be done more strictly than the cast iron ones, especially in the heavy traffic places, such as filling stations. However the damages mentioned above does NOT affect the working function of the polymer manhole covers, but incorrect installation may give rise to the serious damages of the manhole covers caused by vehicles. 1. Afrasian Business is a distributor of PRIMUS® manhole covers in South Africa and has no legal relationship with Primus Trading (Pty) Ltd which was registered in South Africa. 2. Documents, specifications and figures of PRIMUS® and Wuzland® manhole covers, such as Weight, Vehicle Weight Tolerance, Load Capacity and Force Resistance, etc were provided by Primus Trading (Pty) Ltd or the manufacturers. 3. Five years replacement guarantee DO NOT cover the damages caused by malicious breaking, wrong purchase of lighter duty or smaller size covers by the client, and abnormal or improper installation of the manhole covers. No claim of any loss, damage and compensation would be lodged against Afrasian Business and the buyers, owners of the places to be installed or installers have full responsibilities to assess our products before purchase and to have the routine check-out of safety done, as well as the maintenance of surrounding concret of the manhole covers. The same force resistance figures of the covers do not mean the exact same strength of the covers as there are different methods applied in the different standards. EN124:1994 standard describes where to install the manhole covers for each duty classes. We can supply the manhole covers of which specifications and colors can be customized by the clients, the lead time is about 2 months, minimum quantities and deposit required. This rule is also applied to the order of our stocks which are unavailable or not enough for the order quantities. Although our medium duty manhole covers can be installed in the driveway, we still recommend avoiding to park the vehicle with the wheel right onto the cover for a long time, this could shorten the usage life of the manhole covers. It's very important to know the quality and actual load capacity of the manhole covers (not just the duty classes named) before purchase. The clients are advised to consult the seller for the details.